Journey Into Misery 5, Page 29: Mission Accomplished? partially because of the stupidity of the Mighty Protectors! Octobriana called in two other public domain heroes on her latest mission, Jenny Everywhere and Astro-Man. Monochromatic for now, but it sort of fits since they apparently went back in time. You can find more Jenny Everywhere in my own comic Tales To Behold. Octobriana, though created under controversial circumstances, is free for anyone to use. The characters of Astro-Man and Jenny Everywhere are available for use by anyone, with only one condition. This paragraph must be included in any publication involving Astro-Man and Jenny Everywhere, in order that others may use this property as they wish. All rights reversed. 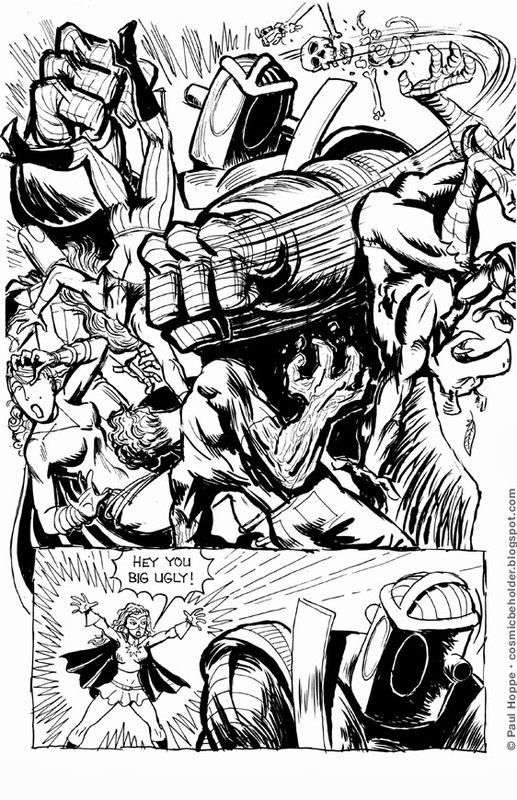 Journey Into Misery 5, Page 27: Look At Mee! Their strategy seems to be working! Glow Girl showed up just in time! The Fantastic Four have new costumes! After the clean white ones, it’s time for– red! 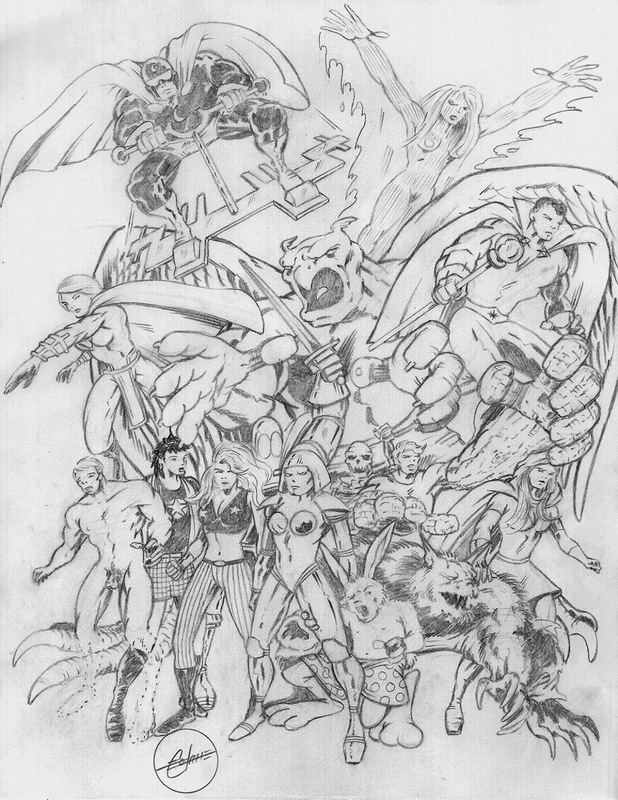 They are designed by the current FF artist Leonard Kirk. Here’s my take on the Invisible Woman's new look. 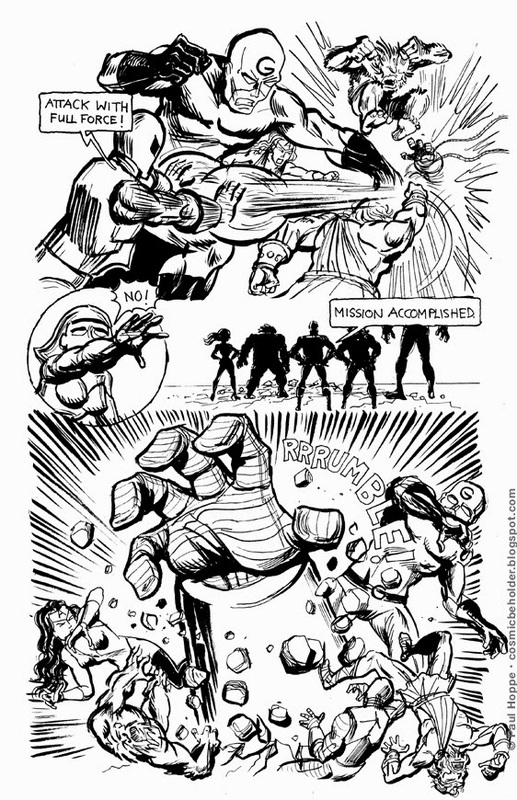 I recently re-read one of the big "Essential" volumes of the early John Buscema Fantastic Four and quite enjoyed it. It's interesting that in the early Marvel days, this was their biggest series, the one that started it all. And in the 70s, The Thing had a solo-series and his own cartoon series. In later decades, titles with more "angst" and darkness like the X-Men were more popular, to this day. Though the stories of John Byrne and Walter Simonson showed you can still make great Fantastic Four stories, even in these more sophisticated, slightly "darker" times. 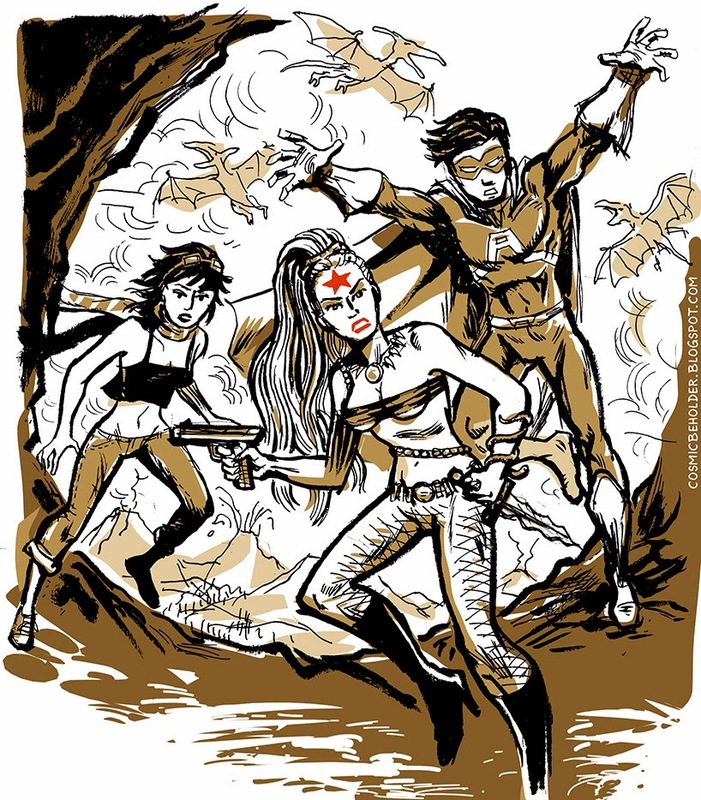 This image is an homage to a famous Superman cover by Neal Adams. 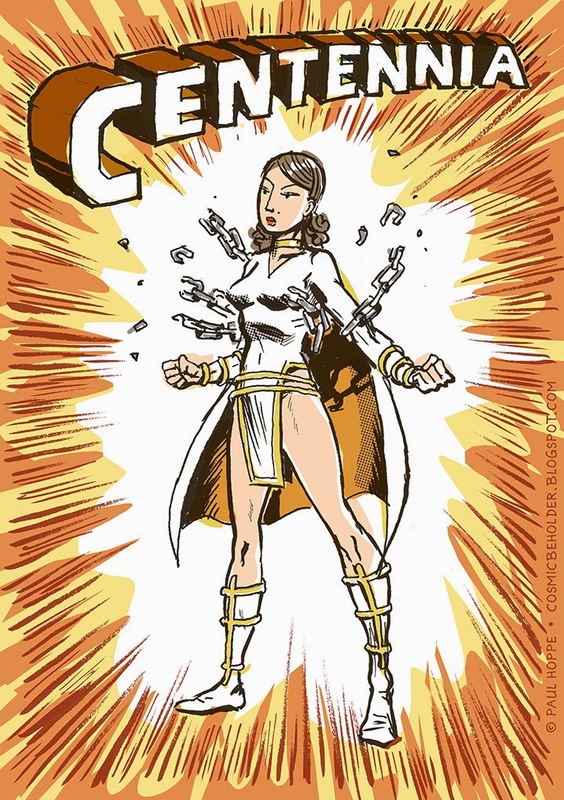 I also did a color variant based on DeviantArtist Tulio's fan-art of Centennia. He did this super-cool piece of her before I did any color design, and came up with his own colors. I like his version, too! Perhaps I can incorporate it into the BEHOLDER canon– it just might be her look in the beginning of her career. In any case it's fun to do those color pieces! I sometimes wish I could do the comics on color– but that would be a LOT of work. Yes, that's what we call action! 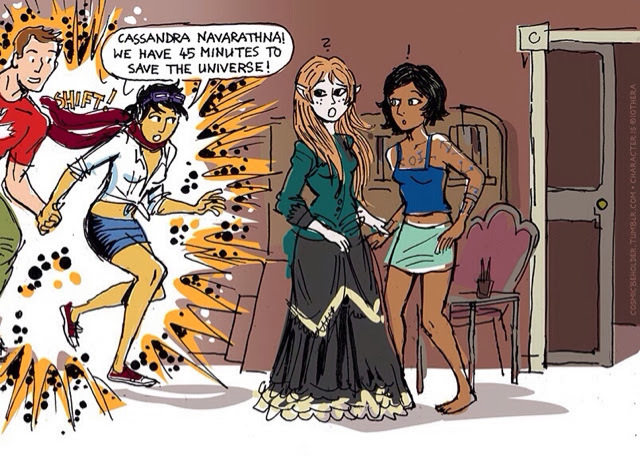 Can Glow-Girl distract the big bully? Super-heroes take selfies, too! 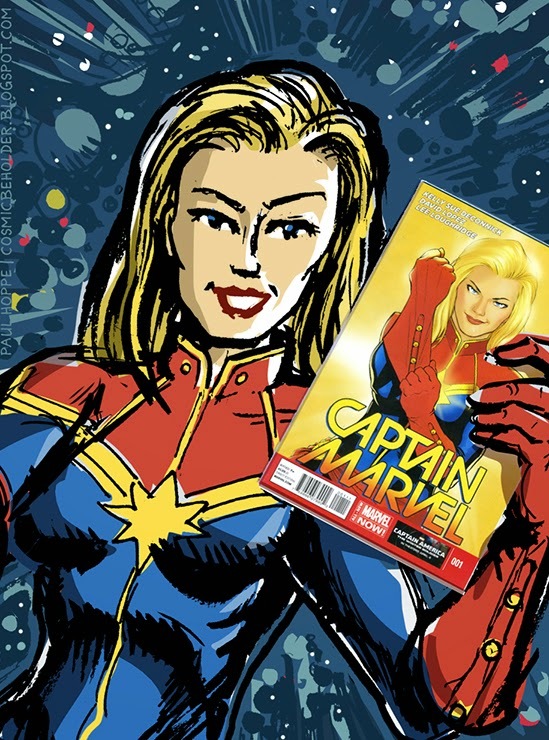 Here's Captain Marvel alias Carol Danvers with the No 1 of her latest comic series. Inspired by tumbler posts of many fans who posted selfies with the new book. Writer Kelly Sue DeConnick has a big and very loyal following, they call themselves the Carol Corps. Nice to see so much heart in mainstream comics. which also was part of Rabid Rabbit's Hell issue. Tribute-Time! She-Hulk has a hip new series from Marvel, written by Charles Soule and illustrated by Javier Pulido. 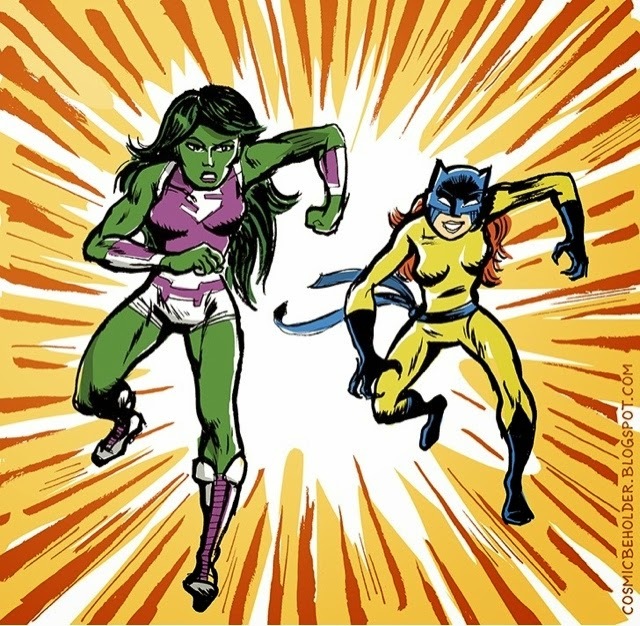 And in the second issue Patsy Walker aka Hellcat joins the book! Two good reasons to create my own take on the two ladies. When I received this incredible piece of fan-art from George A. Lane III from Indiana, I was blown away! It's fascinating to see so many of my characters from Journey Into Misery and Tales To Behold in his Kirby-inspired style. I'm very honored and flattered, it's the ultimate compliment. 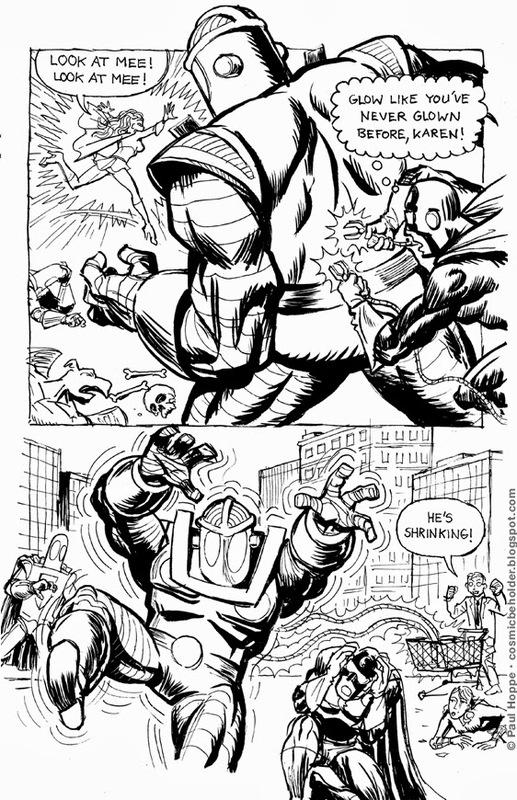 George has actually done some work for publishers, including a retro sci-fi story in the current Garfield comic book. You can reach him at IndyN8rist [at] comcast.net to encourage him to finally get a website, ha! Click to enlarge to see the piece more up close. Thanks so much again! Well it looks like you can't trust anyone! Even witches that study super-villainy at NYU! 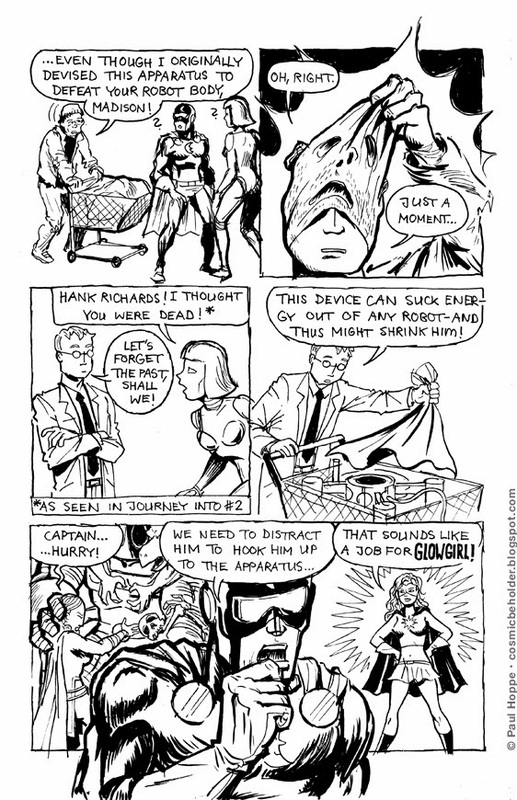 Hank Richards is back! Hiding behind a mask, he was plotting his revenge. But now, he is returning to the forces of good… or so it seems! New comic page is coming tomorrow, in the meantime here is a sneak peek at the risographed cover for Tales To Behold 5, coming out at MoCCA Fest in April! 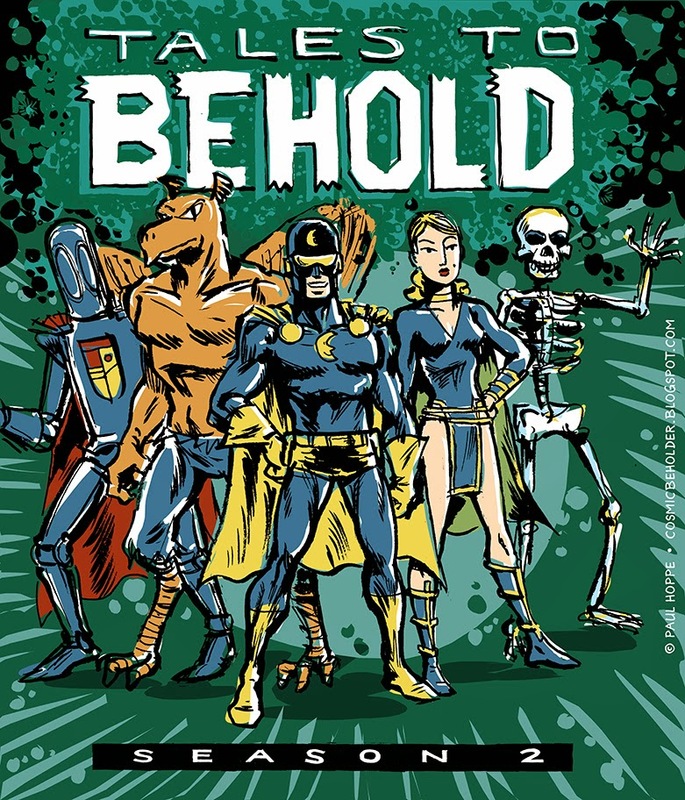 You can order all previous books here: http://www.birdcagebottombooks.com/?s=beholder or get them in NYC at Desert Island, Forbidden Planet, Mysterious Island, or Bergen Street Comics! Mixing it up: Public Domain characters Jenny Everywhere and Jimmy Anywhere visit Cassie and Maureen from the webcomic Iothera (all rights reserved). The characters of Jenny Everywhere and Jimmy Anywhere are available for use by anyone, with only one condition. This paragraph must be included in any publication involving Jenny Everywhere and Jimmy Anywhere, in order that others may use this property as they wish. All rights reversed. This awesome rendition of my characters on the beach is by TheD-Wrek, creator of the webcomic http://twentyfourseven.thecomicseries.com . Thanks so much! You can see more of these guys in the current storyline of Journey into Misery. 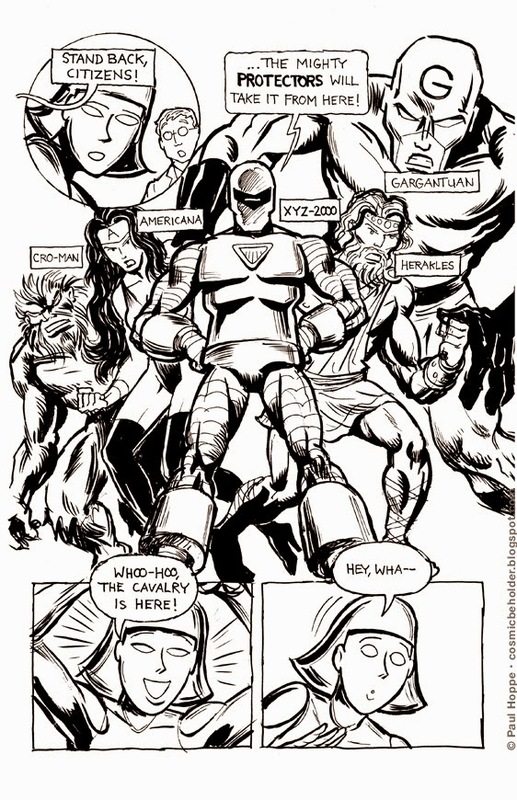 Terry and also Madison (in her robot body) are fighting alongside many of our super-powered friends to defend the city against a giant robot. 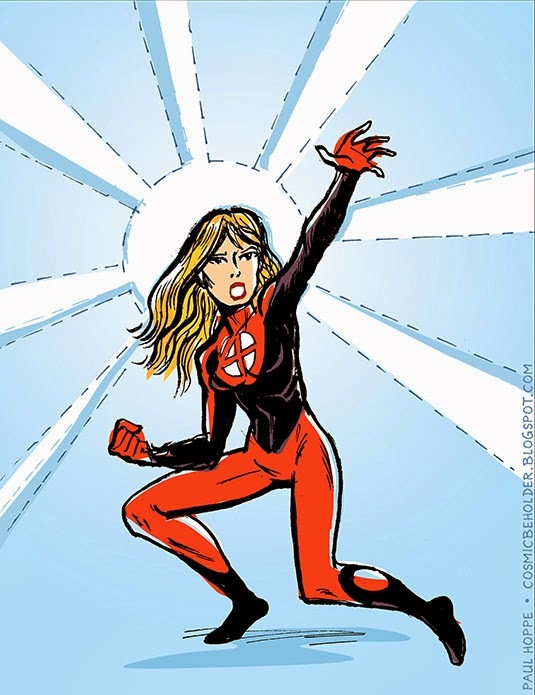 In this dire situation, even the elusive Glow-Girl, jumps into action. So does her manager. 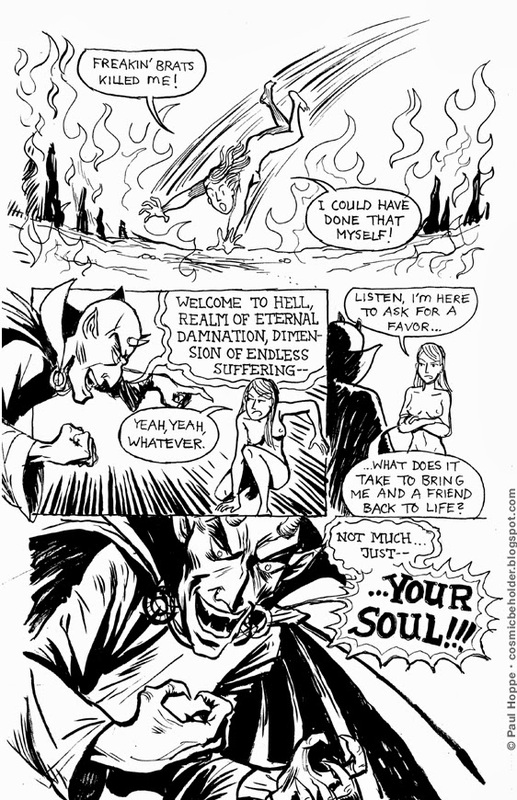 unfavorably way back in Tales #2. Announcing the next stage of THE BEHOLDER project - Season 2 of Tales To Behold begins with issue #5, debuting at the MoCCA Festival April 5th and 6th in NYC. 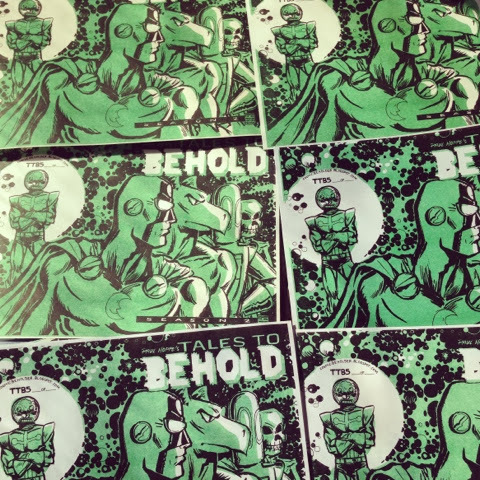 Tales To Behold #5 will be a 40page maxi-comic, produced in a limited edition and this time the cover will be printed in a special way- look out for more info as MoCCA Fest NY comes closer. Tales ToBehold #1-4, and the sister series Journey Into Misery, are available at select comic stores in NYC and online from BirdCageBottom Books!